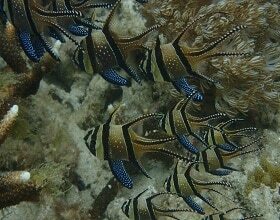 Yayasan LINI and Yayasan KALI (Khatulistiwa Alam Lestari) conducted surveys of the Banggai Cardinalfish as an effort to monitor the populations of this endangered species in Banggai Laut District, Central Sulawesi. This activity has been conducted annually since 2014 with the purpose of supporting the conservation and management of the Banggai Cardinalfish populations within the area of their natural distribution from year to year. The Banggai Cardinalfish (Pterapogon kauderni) is a species of reef fish endemic to the Banggai Archipelago in Northeast Sulawesi, Indonesia, and has a very limited geographical range. It is a popular marine aquarium fish that has been exploited for overseas markets since the mid-1990s. The results of the survey were presented at the stakeholders’ meeting held in Banggai town in May 2017. The local stakeholders, which included local Government and community, appreciated the monitoring program and they have high hopes that this endemic fish will not become extinct. The purpose of the stakeholders meeting was to discuss the plan to include the species in the protected species list under National law, and several options for management measures of the Banggai Cardinalfish. These include closed seasons for fishing, the establishment of conservation areas, a quota which limits the harvested volumes of fish, and allowable size. Further discussions are planned to be held before the end of 2017. “The survey and monitoring activities need to be done continuously in order to track the condition of the populations of this endemic fish so that, if necessary, rapid actions can be taken to save the fish from extinction.” said Surya Risuana, one of the LINI field staff. 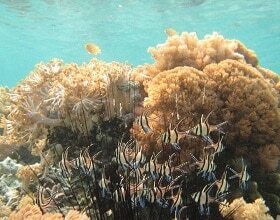 Furthermore, LINI plans to conduct aquaculture activities for breeding Banggai Cardinalfish along with regional Government of Banggai Laut in Banggai Island, to reduce further declines in the fish populations throughout their natural distribution.